3 water bottles, 3 soft drinks and unlimited tea of coffee! 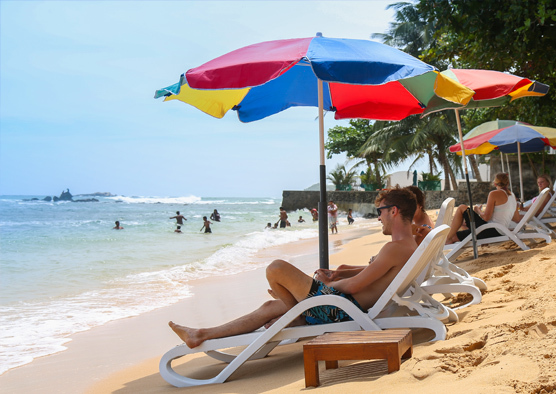 Unawatuna beach is a long stretch of golden sand with clear warm turquoise water, fringed by lush groves of slender palm trees leaning over the golden sand, the most popular choice for tourists in the Southern part of Sri Lanka. 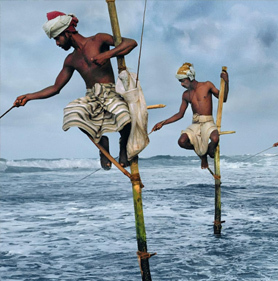 Stilt Fishing is one of the most interesting traditional fishing methods of Sri Lanka. The beautiful sight of fishermen perched branched poles as they fish skillfully during dawn, noon and dusk. 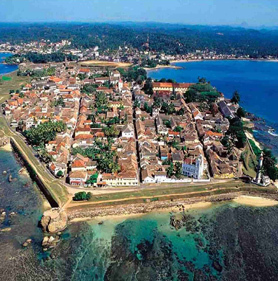 Galle Fort is a historical, archaeological and architectural heritage monument, which even after more than 423 years maintains a polished appearance. The site has been recognized as a world heritage site by UNESCO. See the reef and explore beautiful fish from a glass bottom boat tour. 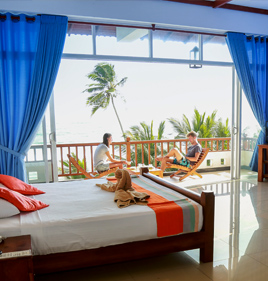 Sanmira Renaissance, this Unique Hotel unashamedly surveys an idyllic ocean scene with elegantly surfing blue rippling soft waves giving you the warmest of tangible feeling of the Indian Ocean. 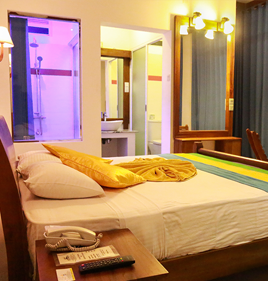 It is the one and only affordable ‘Three Star’hotel along this sultry stretch of Unawatuna / Galle coastline. Neighbored by many tourist activities and truly Sandy beaches stretching hazily into the distance, ‘Sanmira’ is private, trendy and unique that has the spacious of gardens and swimming pool in a calm environment that you would want to treasure as a holiday hideout. 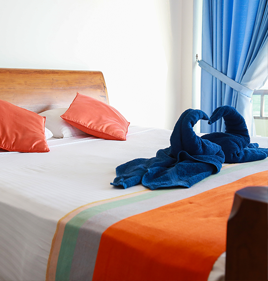 Of the 30 well-appointed rooms installed to stunning views of the Indian Ocean or the deeply peaceful garden that is famous for its tranquility. 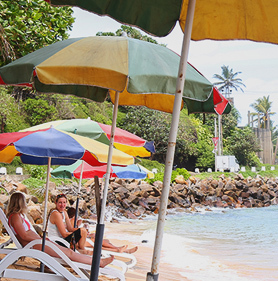 A perfect & affordable Beach destination - Unawatuna is the best! 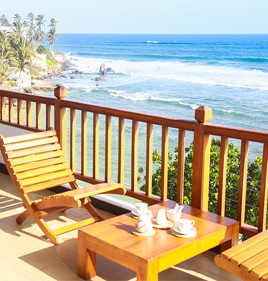 Unawatuna beach is a picturesque horseshoe-shaped bay protected by coral reefs that is reputed allowing to discover beautiful fishes and seashells and a fishing village. 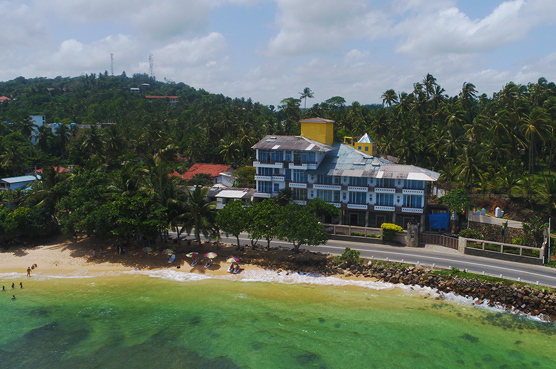 As the numerous other fine beaches in the south western and southern coast line of Sri Lanka, Unawatuna beach is a long stretch of golden sand with clear warm turquoise water, fringed by lush groves of slender palm trees leaning over the golden sand, the warm sun sparkling waves as they break inshore, the most popular choice for tourists enjoying the beaches in the Southern part of Sri Lanka. 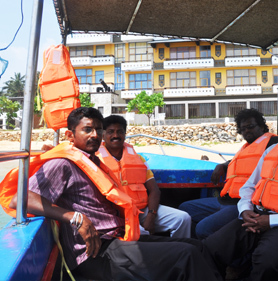 At Unawatuna beach with bit of luck, the tourists may witness turtles laying eggs alone the shore. Diving also affords the opportunity to enjoy the sight of these turtles swimming around the blue waters of the Indian Ocean, an incredible experience shouldn’t be missed!